India is going digital, but why are we still reliable on offline method while paying our electricity bill? When Electricity Bill can be paid online without taking any inconvenience to visit the Goa Electricity Department Office or Banks, why are we still using the traditional mode when it comes to paying our Goa Electricity Bill? The traditional mode of paying electricity bill offline wastes our time as well as energy. 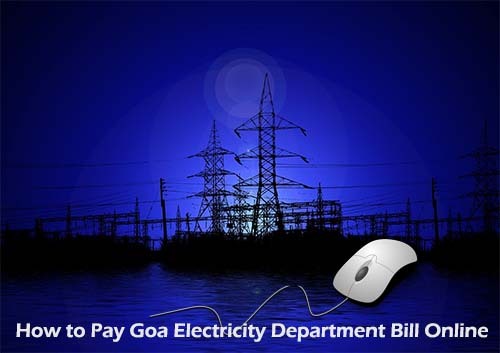 So to help you out on paying your Goa Electricity Bill Online, below we have arranged a step by step guide which will explain you clearly on how to pay Goa Electricity Department Bill Online. As of now all major bill payment wallets like Paytm, MobiKwik, and Freecharge etc. still have not partnered or integrated Goa Electricity Department Biller in their list. But you can still pay your Goa Electricity Bill Online via Goa Electricity Department Official Website by using Internet Banking, Debit Card or Credit Card. From Goa Electricity Official Website, Online Services option just click on Pay Online. You will get navigated to new page called Electricity Bill Payment, where you will have to enter your Contract Account No. or CA Number which will be present in your Electricity Bill. Make sure you enter the Contract Account No. correctly and click on view details button. On next page your latest bill details will get displayed showing your Contract Account No., Name, Bill No, Bill Amount, Issue Date, Due Date, and payment Status. So to pay your bill, just click on proceed payment button. On next page Payment Request Confirmation will get displayed showing your name, email, mobile number, payment towards and amount payable. So to confirm, just click on confirm and proceed to pay. You will get navigated to payment gateway of SBI, where your echallan number would be generated and you will have to complete the captcha by entering the same in below field and click on initiate payment. From next page you can select your preferred payment modes from Net Banking, Debit Card, Credit Card or UPI and make the payment. Once making the payment successfully, on next page your e-receipt will be displayed showing your echallan number, total amount paid, bank received date, bank reference number, status and status description showing completed successfully message. You can save this receipt or print it for future reference. That’s it, this is how you can pay Goa Electricity Department Bill Online at the comfort of your home. Recently Bharat Bill Payment System has integrated Goa Electricity Department as a biller in Bank/Non-Bank for Quick Bill Payment Apps. So from now onwards Goa Electricity Department can be paid from all major banking apps. So let’s find out how you can pay your Goa Electricity Bill Online via various third party banks / wallet App and Portals. To pay your Goa Electricity Bill Online via MobiKwik through Bharat BillPay, you should have your Contract Account No. or CA Number. On MobiKwik Home page just click on Electricity option from Recharge and Bill Payment Section. Select your operator from the list, which is Goa Electricity Department and enter your Contract Account No. or CA Number and click on go button. It will fetch your electricity bill and display due amount and due date, with your name etc. So to proceed paying the bill just click or tap on continue button. On next page it would ask you to confirm the details of bill payment, so if everything is correct displayed in the screen then just click or tap on make payment button. You will be navigated to payment page where you will have to enter your debit card or credit card details to complete the payment. Once successfully complete the authentication of bank, your electricity bill payment will get successful and on next page all payment details like Txn Ref ID, Bill Number, BBPS Ref ID, will get displayed.